Are you struggling with restrictions and blocks from accessing some popular sites? Check out the following residential proxies you use for scraping the web with no blocks or downtime. When it comes to web browsing, there’s a need for freedom to access just about any site they want to with no restrictions. In truth, that is not the case. Some sites restrict access by blacklisting IP addresses from particular geolocations. In order to scrape the web in the wake of such restrictions, there’s a need for reliable residential proxies. With their IP rotation services, it is possible to avoid unnecessary downtime and access restriction. In this Post, we have captured some 10 best residential proxy providers. Business Choice: #1 world’s Largest residential proxy network run via Hola VPN. Why I rank #0 for Luminati? If you’re individual want to use their residential proxies, you have to take a photo for authentication like a criminal, also they need your government ID with photo also! When I use their proxies, I found I almost naked to them…So, If you’re a guy who does really care about your privacy, I suggest you skip it as “0”. You don’t like the constant downtime and restrictions while accessing web pages? Luminati offer the Residential and Mobile IPs are all you need. Scrape any web data with no blocking or cloaking. This is the only proxy provider that serves Fortune 500 enterprises and also has tight customer compliance procedures. With Luminati, retailers are certain to offer very competitive prices by leveraging on the price comparison algorithm to scrape competitor pricing data with o blocks or IP blacklisting. This proxy provider is also used by Ad networks to view advertisers’ landing pages anonymously. They keep you safe from malicious advertisers. What’s more, you will also enjoy unparalleled brand protection, sales intelligence, and also self-test your website from any location in the globe. Overall, Luminati’s proxy network offers lots of their product is the best in my views except for price and troublesome authentication! You can read this guide about How to use Luminati’s residential proxies via Their API, Chrome Extension and Luminati Proxy Manager (LPM). Supports easy switching between different proxy types; residential IPs, mobile IPs, shared and data center private proxies. Supports IPs in every country, city, ASN, and carrier. Provides exclusive IPs assigned specifically to individual users. 9% network uptime and a real-time network status monitor. 30+ million mobile residential IPs – GEO targeted proxies for marketing & advertiser. Oxylabs is known for highly anonymous proxies from all over the globe. They have a pool of some 30M+ real proxies owned by ISPs and used by homeowners. You can be sure to access the web with no limitations or restrictions like IP bans and blocks. Your browsing experience will be compatible with scraping bots while also providing you with unlimited concurrent sessions and zero captures. What’s more, Oxylabs’ residential proxies guarantees its uses easy session control features and 100% anonymity on the web. Their residential proxies are used by businesses to drive revenue. This is done by letting users evaluate how ads are displayed to different people and also lets you check the advertiser’s landing page. Oxylabs’ residential is also used by travel fare aggregators to collect data from hotels, flight companies, and even travel agencies anonymously. This data can be used to determine appropriate prices for different products. They offer a free trial for each of their products; entry, advanced, pro, enterprise and corporate. They deal in legit IPs which are less likely to be blocked or banned. They offer residential proxies compatible with scraping bots. Best Solution for sticky residential IP proxies. Looking for the finest residential IP proxy network? Netnut proxy lets you scrape the web anonymously without ever being blocked or even misled. The very architecture of their residential proxies supports one-hop connectivity. And there are no traffic bottlenecks because Netnut never channels traffic through users’ devices. Its proxy IPs also guaranty quality connectivity because they are connected on major ISP network connectivity points. To ensure smooth connections with absolutely no interruptions, Netnut routes all traffic through its own network, no third party systems are used. This puts all risk of data security breaches at bay. In case of any queries and concerns, they have a 24/7 dedicated account management team. You also enjoy full integration support with TeamViewer sessions if needed. The Netnut proxy has a sticky IP with a unique identifier uniquely mapped to the same exit IP for smooth web scraping. Its residential proxies seamlessly integrate with any web browser and each browsing session is assigned a unique IP. Each search engine request generates a new IP for sustained anonymity. Simple and user-friendly control dashboard that supports real-time access to all usage statistics. All these can be retrieved via a simple API. All IPs are pre-verified for optimum performance success rate. Supports optimal latency because all its exit nodes are located in major internet exchanges and data hubs. 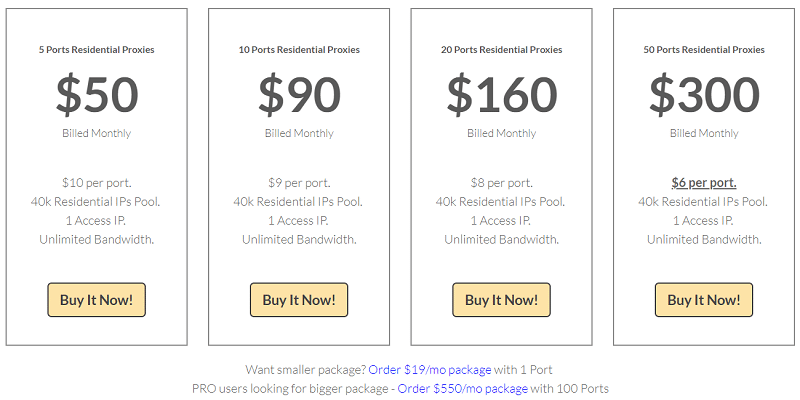 Ports type of the traditional Backconnect Residential Proxies: Unlimited bandwidth. Note: Their Basic Backconnect Residential Proxies are Limited functionality, Only suggest buy their Special Backconnect Residential Proxies. With 26 million IP addresses that consist of real homes and real people, quality service potential is there. They are providing backconnect, dedicated https and shared https proxies. Their residential proxies pay via the port, that’s different to other residential proxy providers which pay via Bandwidth Usage. So you can get Unlimited bandwidth! Microleaves service offers a wide variety of subscription plans for every need. However, they are limited by threads and that might seem not flexible in some use cases. One of the best residential rotating proxies for individual & small business. Comes with a 1 GB network that is optimized for high-speed performance and fast multithreaded tools. With StormProxies, you are sure to get instant access to otherwise restricted sites immediately after payments; you won’t have to wait for account activation and proxy setup. Once you subscribe, you will get unlimited bandwidth and other attaching goodies. StormProxies has absolutely no hidden costs. Their premium private dedicated proxies are optimized for speedy web access. What’s more, you get to enjoy high-level anonymity on the web in addition to 24/7 customer support. And Storm Proxies products are 100% risk-free; they offer a 2-day money back guarantee on all products. Cost-effective choice for business – 2 Million clean Global residential IPs Proxies. If you are looking for an enterprise global residential proxy network with tested and proven talent sourcing, sales intelligence, ad verification, brand monitoring, and web crawling, count on GeoSurf proxies. Their p2p network allows users the freedom to harness the full business potential by tapping from a pool of 2M+ unblocked IPs. Enjoy an enterprise-level business performance by making use of their inbuilt IP rotation API which is tailor-made for optimum performance. You get to send unlimited concurrent requests on millions of verified IPs. Their residential proxies come in different plans; starter, January special, plus an enterprise membership plans. All these plans are affordable and guarantee subscribers unlimited access IPs, dedicated customer support, access to residential IPs from some 130+ countries worldwide. 2M+ unlimited clean residential IPs which are never detectable as proxies. Coder friendly API that supports copy and paste option. Supports some 130+ geo locations including US, Canada, Germany, Mexico, Thailand, Brazil, etc. A dedicated premium customer success manager for all Enterprise customers. 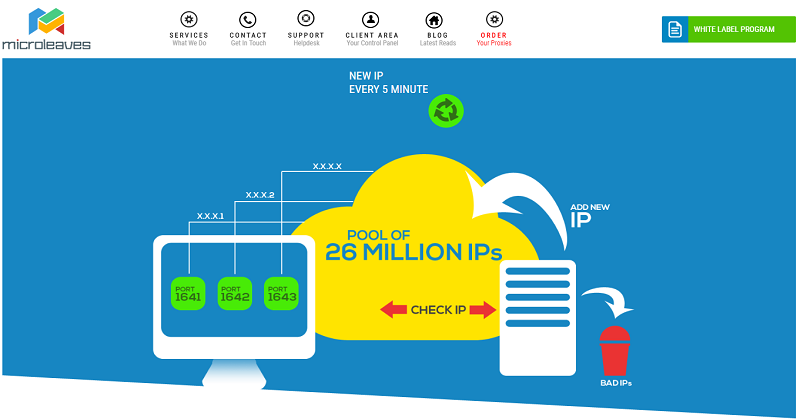 Unlimited access to Geosurf’s IP pool. Each user gets access to a detailed usage statistics for their account. A most affordable choice: Cheap for lots of IPv6 IPs in their Pool. Note: Their Proxies are not fit for Instagram…I lots of IG account for their proxies! The smart proxy has some 10M+ rotating IPs that are location targeted, easy to use, and very flexibly priced. The proxy IPs work fantastically with web crawlers or any other software used for improved browsing speeds. SamartProxy can also be used by developers for accessing raw HTML data with simple API call by simply overriding Captchas and other access blocks. Because of its smart routing logic, their residential proxies routes requests through different subnets. The requests are also throttled automatically in order to avoid IP bans and blocks. Web scraping has never been this easy. Smart proxy is also used as a market research tool and also in monitoring competitor pricing before product releases. It has a very intuitive and user-friendly control dashboard which is accessible upon successful registration and payment completion. Its geo-targeting function gives access to some 190+ countries and cities worldwide. Comes with a 5GB starting package, but users can get extra space by simply upgrading to other plans. Control dashboard is simple and easy to use. All proxy IPs are checked for Spamhaus and blacklists. A powerful backend that lets you scale fast. Has different plans; micro, starter, regular, and advanced. A cheap residential proxy provider also offers residential VPN. Not many residential proxy providers deliver their products via VPN. Proxyrack does though. With their residential VPV plans, you get to watch your favourite TV shows, movies and other geo-restricted contents from any country. Their super-fast internet connection helps encrypt and mast your online activity thus maintaining your online anonymity. Proxyrack residential proxies are highly compatible with m0st operating systems; w9indows, Android, MacOSX, iOS, etc. This also ensures optimum performance, speed, and stability. What’s more, Proxyrack has a very simple but attractive user interface for easy navigation and access to onsite contents. Their proxy plans are very affordable and come with a 14-day money back guarantee. Because it supports multi-login, users can sign up and use up to 5 accounts for the price of one. It comes with an internet kill switch which disables your internet connection whenever the VPN connection is interrupted. 24/7 technical customer support and free routine updates. Small pool with bad customer support. Looking for legit USA proxies with no limits. 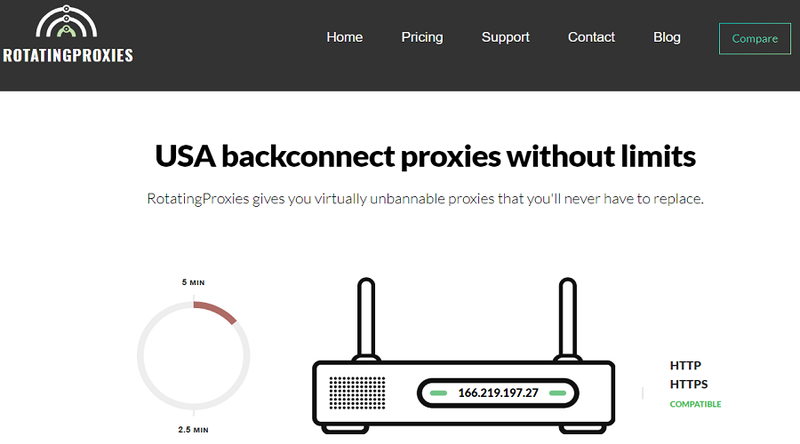 Rotatingproxies has very diverse back-connect proxies that are robustly designed for HTTP/HTTPS compatibility. Enjoy unmetered bandwidth access and zero connection throttling for quality web scraping. 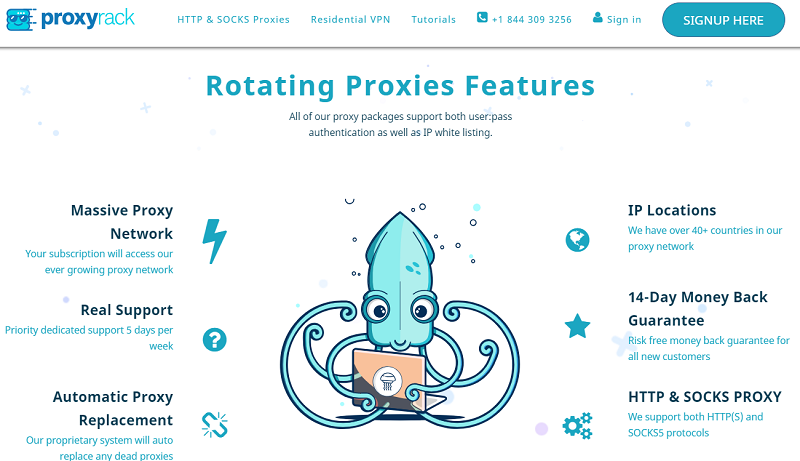 Their residential proxies protect your connection with privacy features like unrestricted URL access logs and secure HTTP message headers. They have an evergreen proxy peer pool featuring a wide variety of IPs, subnets, and broadband ISPs. Industry-leading 5 minute proxy rotation provides you with a new and unique identity thus making it hard to be blocked or banned. 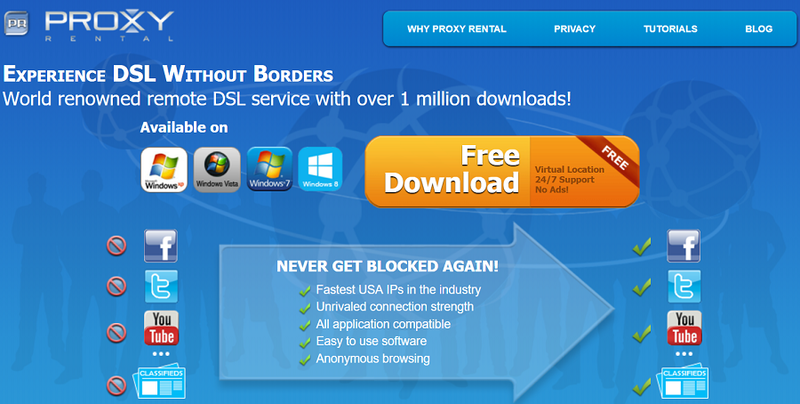 What’s more, you’ll also enjoy accessing the web via USA-filtered proxy plans. Depending on the selected RotatingProxies membership plan, you can get access to geo-target back-connect proxies from tier 1 countries like Canada, UK, France, etc. In order to maintain the premium quality of its network, the pool of back-connect IPs at RotatingProxies are reviewed and refreshed daily. Curated proxies that support HTTP and HTTPs requests. Proxies built for URL scraping, account creation, and brand protection. Supports proxies from multiple geo-locations. An evergreen proxy pool featuring numerous IP addresses, subnets, and broadband ISPs. Software type of residential proxies: Free plan support 6 residential IP changes per day. Are you an offshore marketing lead reseller looking to know how to change US IP addresses or how to find a US IP? Proxy Rental got you covered. Enjoy scraping the web in an environment that has absolutely no bans, ghosting, constant breakdown, and routine fixes. That is what you get with Proxy Rental residential & dynamic DSL IPs. You want to maximize your business profits while maintaining your anonymity, Proxy Rental is all that you need. This proxy platform gives its users the capacity to change and even hide their IPs. And because their USA proxies are constantly refreshed and never duplicated, you can be sure to explore and use exclusive US IPs and proxies. Get started with Proxy Rental free trial package and turn around your business success. The free version, however, has limited features. You can upgrade to any of their paid plans whenever you wish. Because it supports multiple logins, you can create and use different accounts for SEO, social media, online classifieds, and postings to forums and other business marketing purposes all for the price of one. Supports anonymous web scraping by keeping your IP hidden. Supports multiple logins: Each user is allowed to create and use multiple accounts for the price of one. Get more than 5 times your return on investment by using their exclusive US IP changing pool. Supports free trial and premium paid plans. Supports live ads in multiple cities without risking being banned, ghosted or even flagged. Come with a step by step installation and user manual that allows users to maximize business profits while cutting down their expenses. A newbie offers residential IP proxies. Enjoy browsing the web without limitations or restrictions by choosing safe and secure residential proxies. Only deal in legitimate residential proxies that won’t put your site and data at risk of unauthorized access. Local proxies source their servers from legitimate sources. As such, subscribing to any of their premium plans is an assurance of compliance to all related laws and regulations. Absolutely no risk of IP blocking and geo-related access restrictions. What’s more, their proxies are routinely updated on a daily basis. Because their proxies come from random ISPs and subnets, users can rest assured of 100% anonymity whenever they scrape the web. And because they have an exclusive network, their proxy packages are, without a doubt, safe and secure. LocalProxies has different membership plans all of which are customized to suit the very needs of subscribers. 100% undetectable back connect proxies for anonymous web scraping. Exclusive IPs from private residential proxy networks. If you are out to get the most from the web, you need the freedom to access data from just about any site of your dreams. That is only possible when you use residential proxies. Finding the best provider can be very challenging especially if you’ve never had or used them before. This review has summarized some of the best residential proxy providers. Be sure to compare and contrast each of them for the best deal.